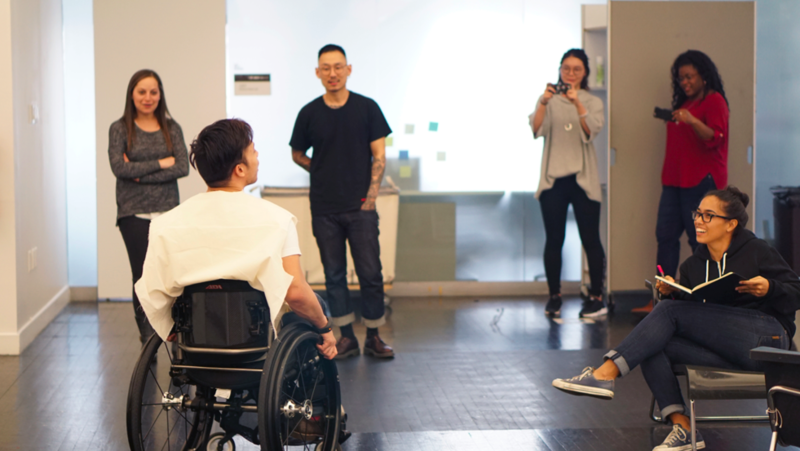 This collaborative studio course at The New School, Parsons School of Design challenges students to create wearable solutions that encompass style and functionality for the inclusion of people with disabilities (injury, aging included). Based on the mission of the nonprofit, Open Style Lab, this course strongly focuses on user-centered design processes in relation to making universal design by having people with disabilities be part of class curriculum. Students collaborate in teams of 3-4 with other students that do not have the same skillsets. Teams will be asked to conduct a series of interviews with one client with a disability to determine a framework and process that prioritizes a concise goal. Students will learn from each other skills in their own relative discipline with guest speakers from people in the fields of physical/occupational therapy, health, and other related disciplines. The class explores unique user-centered design processes, inclusive vocabulary, and ability in relation to fashion and technology. Tools such as 3D scanning, electronics to measure range of motion, and smart fabrics may be deployed. Design process frameworks explored in this class may include the following: Participatory Universal Design; Methods and Applied User Experience Research; Developing Design Constraints – aka- “Design Requirements”; and Identifying Variables to Test for Design Iteration. Note: Due to the level of commitment required to work with people with disabilities, students must email the instructor a paragraph on why he/ she wishes to take the class along with an updated CV before the 1st day of class. Final selection of students will be portfolio based. This course is equivalent to PSAM 5550 Collab / SOF Fashion Studio Elective. Open to all university graduate degree students and undergraduate students. Instructor: Grace Jun, Assistant Professor of Fashion. A voice amplifying wearable necklace created with a person with multiple sclerosis. A rain jacket that fits into a backpack adapted for an electric wheelchair. A wool coat that was custom shaped for posture with a person with cerebral palsy. An inflatable vest for seated comfort for a person with a curved spine due to bone cancer. Leggings for the seated body that has easy access to a catheter. All work presented adhere to the protection of faculty/ student rights under University Policy.